Some days you find the right place and feel like the world is on your side. This was how I felt when I recently had lunch at Gusto on George Street. 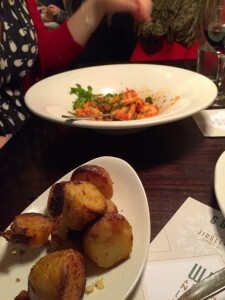 With a really clued up team and a great range of food for the coeliac, this was a very good dining experience. We had one small hiccup, that the whole meal that came, including the food for my non-gluten free companion, was gluten free. However, this was a massive compensation for me, as it meant I could try the Gusto gluten free pasta option – which is extremely good and indistinguishable from the “normal”. And my wheat friendly friend gave it the thumbs up, which is an accolade! The other point I would make is that the menu has no indication of GF options or any pointers, so we were entirely dependent on the waiter for guidance, which could be a problem in some circumstances. The inability of restaurants to offer gluten free chips was one of the shocks when I first started dining out, but I have to applaud Gusto for offering some delicious roast potatoes as an alternative. Flavoured with herbs and garlic, they were actually better than chips and I would not normally have thought of ordering them. They came, accompanying a very good Romesco Salad – with goats cheese and chicken. My unwittingly gluten free friend had a seafood pasta, which had a garlic tomato sauce, a lovely herby tang and was extremely tasty. The food is well presented and came quickly, which is impressive as the restaurant was busy. With two large glasses of wine, the menu came to a very good value £35 – all with good service and friendly and clear help. 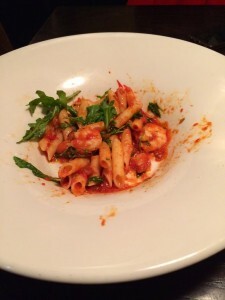 Add this to your list of gluten free dining options and you will not regret it. I was so taken with it, I plan to go back next week with a group of friends. Apologies for the photography – we had tucked well into our delicious meal before I remembered that I had to photograph it!